Plot Summary: The game begins by informing you it takes place in “New York City, Present Day”, and that made me a little excited, because that’s where my life also takes place. But I soon discovered it is not the present day, but something much worse: 1995. 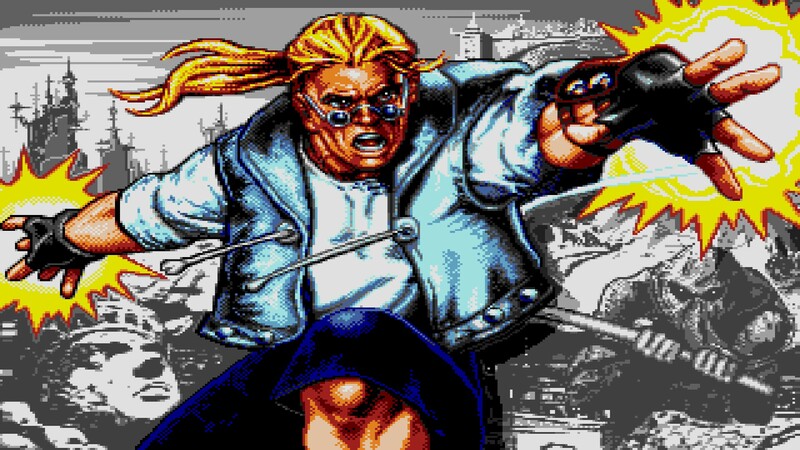 You can tell because the protagonist is as 90s anti-hero as you can get. This is him. His name is Sketch Turner, and he’s a comic book writer (Sketch? Get it?). I don’t why he has magical hands in this picture, or why his sleeveless vest has pasties on it. I appreciate that he has glasses though actually. You don’t tend to see a lot of out-and-out hero types who wear glasses, just typically scientists or lawyers or whatever. So I do like the positive representation. There’s not much to like about Sketch otherwise though. He’s an oddly muscular writer, whose personality is just an amalgam of ’90s “cool dude” tropes. Also, he has a pet rat. It is New York, after all. So one night, while Sketch is working on his comic in his impossibly nice midtown loft, the inevitable happens: the villain turns real and comes out of the comic. There’s no explanation for why this happens. Or why the villain of Sketch’s comic is such a weird looking goofball. He’s an alien/robot/cowboy, with one eye, who wears a leather duster and fedora, and has a Yosemite Sam style mustache. His name is Mortus. So, he bursts out, explains that he’s still a drawing, but if he can kill Sketch in his own comic, then he’ll become real (obviously). If Mortus feels any disappointment at learning that the god that created him is a deadbeat writer who lets rats crawl on him, he does not show it. Sketch doesn’t get any time to reflect on the power to create life that he has suddenly developed because he gets thrown into the comic world. This is presumably the “comic’s zone” of the game’s title, sans Xtreme spelling. In the comic world, he meets general Alissa Cyan, an intriguing woman who is the head of some organization that opposes Mortus. We meet no one other members of this organization though, so it isn’t clear who, if anyone, Alissa is actually the general of. Anyway, she just straight up tells Sketch he’s the chosen one, and that he has to defeat Mortus, which he was probably going to try to do anyway. You might think a writer/illustrator like Sketch would be ill-suited to taking on the comic-book bad guys he has created, but Sketch doesn’t look like a beefcake for nothing, and can punch and kick surprisingly well. He proceeds to battle through his own comic book, but thankfully his magnum opus is embarrassingly short. It’s just six pages. It’s also a disjointed mess of frequent location changes and fight scenes, from which I conclude Sketch is actually a pretty bad writer. So, it’s like a Twilight Zone episode about a hack writer trapped in a hell of his own inept creation. The story then takes place over 3 two-page “episodes” (wouldn’t “issues” have been better? ), that sort of vaguely form a plot. In the first one, Sketch defeats an alien queen who is producing mutant soldiers for Mortus. Then he journeys to a Kung-Fung (sic) martial arts monastery-temple-arena in Tibet, to destroy the place where Mortus’s soldiers are trained. Then in the last installment, he ends up in a weird desert / ship graveyard / weapon factory / nuclear bomb place. There, Mortus comes back into the comic to kill Sketch himself, which is really a bad judgement call on his part. To up the stakes, he throws Alissa into a drowning machine, and proceeds to square off with his creator Sketch. Then, there’s actually three endings. If you ever die, Mortus does become a real boy. Then he goes out onto your balcony and proclaims that he will “ROCK THIS WORLD”. The game presents Mortus as an evil alien guy, so this is a pretty weird and unexpected threat for him to make. Not “destroy” or “conquer”, but “rock”? Maybe he only wanted to become real to share his love of music with the world? We’ll never know. This is, allegedly, the bad ending. If you don’t defeat Mortus in the final fight fast enough, then Alissa drowns in the drowning machine that’s part of the nuke. It’s really grisly actually: she struggles inside this tube filling with water throughout the fight, and then she drowns and then just floats there lifelessly until you win. Then Sketch comes back to the real world, but sans Alissa, and the comic inexplicably burns up. 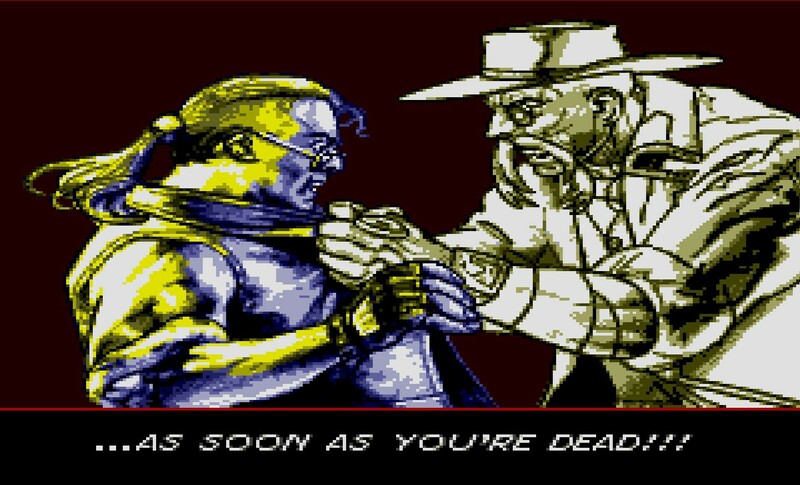 The game points out this isn’t a victory worth celebrating, and asks “Will Sketch unleash the evil once again, to re-live his adventure, in the hope of a better ending?”, which is among the least subtle ways you can telegraph to the player “YOU GOT THE BAD ENDING”. If you do save Alissa, then Sketch comes out of the comic with Alissa in tow, and gets her as a reward, despite no hint of romantic attraction between the two prior to this. Alissa also comes out as a real person, she doesn’t need to kill anyone to become real I guess. Then you’re treated to the epilogue. Sketch publishes ‘Comix Zone’, and it goes on to become a “commercial smash”, and not only sells out, but becomes the best-selling comic of all time. Not bad for 6 pages of fight scenes and no plot. Roadkill the rat also gets an epilogue about eating 100 pounds of mozzarella that I’m sure seemed funnier when they wrote it. But what of general Alissa Cyan, you wonder? Her single ungrammatical sentence of epilogue explains: “Alissa Cyan joined the army, soon to become the chief of security for the United States”. Oh okay. Action titles usually end with victory celebrations and good triumphing over evil, so I give Comix Zone points for telling us about the hero and heroine’s career results instead. 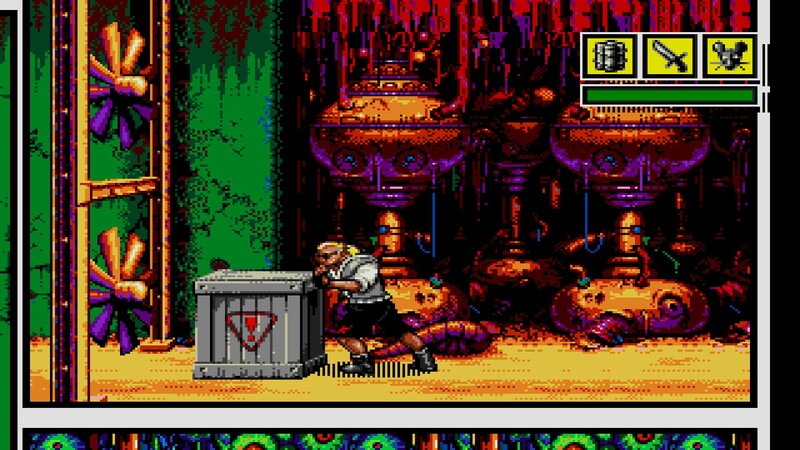 Gameplay Summary: Comix Zone is a side-scrolling beat ’em up, and has no real surprises in its core gameplay. You can block, throw punches and kicks, and chain them together for combos. You mostly face one or at most two enemies at a time, and that’s because the enemies are really well crafted. Most games need to throw hordes at the player because they’re individually so simple, but the mooks of Comix Zone have varied move sets and quite responsive AI. It makes them pretty fun to play against, since they behave more dynamically than the typical walking punching bags of side-scrolling titles. They do block too frequently though, which means the sparring sessions can drag on a bit. Overall though, it’s a good combat system really. It doesn’t really capture the dynamic POW! ZOP! 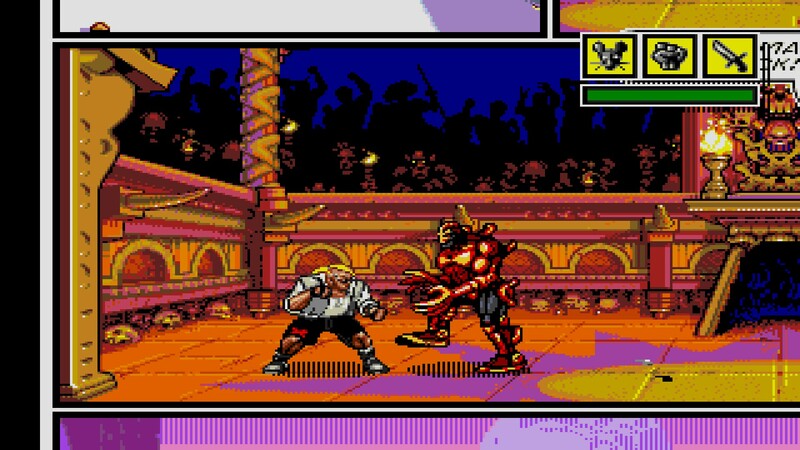 action of a comic book fight, but it tries admirably to mold solid action-arcade fighting into a more comic-y sort of style. Most of the game is occupied by these fights, but there’s also a surprising amount of puzzle solving as well. There’s usually multiple ways to navigate a given level, and the brute force “punch your way through a door” approach is almost always wrong. You can use your pet rat to find hidden items and activate switches, and sometimes parts of the background or scenery can be manipulated in surprising ways. These elements sometimes work well. Like, a player needs to get through a moving fan, and the room has an explosive crate in it. Ah-ha! I push the crate into the fan and run away, and can waltz through unharmed! More commonly though, you discover the solutions randomly because there’s no real logic to them except trial and error. The same approach extends to the three level bosses, all of whom feature a sort of “short cut” puzzle to beating them. The first two of these are actually pretty clever. The first boss shoots fireballs, and if one hits a barrel while you’re taking cover behind it, turns into a burning barrel which can then be pushed under the boss for massive damage. Its discovery felt natural, made sense, and was fun to interact with. That’s pretty solid design. The final boss is a bit more hamfisted though: You lure him to the exhaust of some rockets, and pull a lever to have the fire blast him, and then rinse repeat until he’s dead. It’s too obvious and straight forward, so it instead just feels like a poorly designed boss fight. Overall, despite some uneven implementation, the game has some great core mechanics and would actually be really fun if it wasn’t for the elephant in the room: absolute soul crushing difficulty. This game was famous for its difficulty in 1995. It says a lot that in an era remembered for its exceedingly difficult games, people thought this was too hard. You have a meager amount of health, limited opportunities to heal, and the fights all require extremely quick reflexes to complete flawlessly. Also, almost everything in the game hurts you, including hitting doors to progress or crates to crack open, which seems completely sadistic. There’s also a fair amount of controller-throwingly-awful instant kills, like bottomless pits or fire. There are no lives either, so if you die, you restart the level. Play Summary: The difficulty is obviously present to extend the game’s short length. The game spent too much of its budget on the level art, which is all beautiful and barely even recycled, such that almost every room is unique. It’d be praise-worthy art direction if the game wasn’t lacking in every other area, having only four or five enemies across the just six small levels. How then to create the illusion of getting your money’s worth of play out of it? By making it so difficult it’ll be nearly impossible to complete! I stand-by very difficult games where the difficulty is an integral part of the game design (like the Dark Souls series, most famously), but here, it’s just a cheap tactic to hide the game’s meager length. The difficulty here completely undermines the parts of the game that do work well, actually. I found the fights fun and kinetic at first, but died repeatedly. Because the game expects almost flawless play to proceed, so you can’t actually enjoy the fight sequences, you instead need to play carefully and conservatively to avoid every hit you can. That’s especially ridiculous when the game’s setting is a comic book, where we expect characters to take a beating. 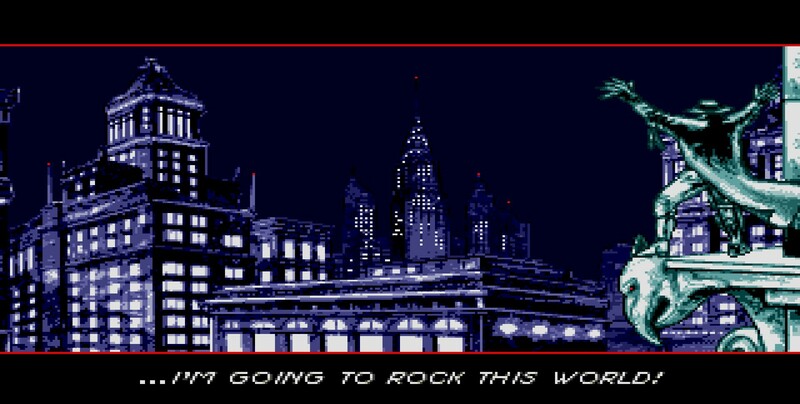 And while the art is spectacular, truly some of the greatest vintage pixel art I’ve ever seen, it becomes significantly less appealing when you see it over and over again. Altered Beast was also short and difficult, but at least had the excuse of starting as an arcade cabinet (and still wasn’t as frustrating). 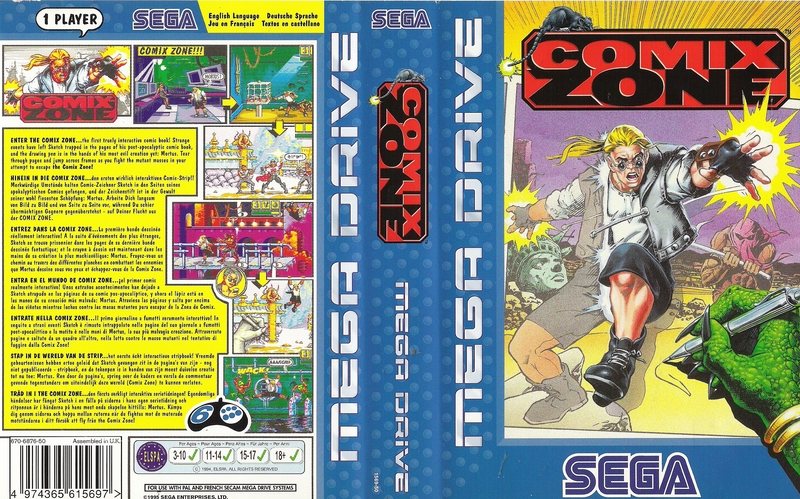 Comix Zone was built for the home market though, and was one of the last game’s released for the Mega Drive, as Sega’s next system the Saturn was already out when this was released. Instead of reflecting the pinnacle of the platform though, it’s an over-engineered mess, trying too hard to be cool. Oh right, I haven’t mentioned that yet, but the game’s humor is pretty cringe-worthy. It feels like a particularly patronizing attempt to be cool, as if shoving in all the ‘Oh yeahs!’ would pass as young person vernacular. Also, if you push down on the controller in some areas, Sketch farts. OMG LOL. While the game has a lamentable but typical presentation of masculine and feminine gender norms, viz punching and being rescued, I was completely unprepared for the outright misogyny written into one of the enemies. “Mongoria” is an acrobatic fighter who uses her bladed ponytail like a grappling hook, and while that’s a pretty stupid schtick, it’s mostly forgivable. What isn’t forgivable is her dialogue, which is just a barrage of sexist characterization. No other enemy says anything related to their (male) gender, but it’s all Mongoria can talk about. Her fight taunts include “a female touch!” and “sweep me off my feet!”, and she says things like “Hey, I’m tender” when hit. When defeated, Sketch says “Maybe its my deodorant” or “Sorry, no date!” because its important to conflate physical defeat with sexual rejection, for some reason. And that’s if you want to defeat them in combat at all. When fighting Mongorias (and they do have a fun fighting style and so are quite challenging), Alissa will radio in to tell you that “Your rat could be useful here!”, while presumably hating herself for saying so. If you release Roadkill, who has no combat purpose anywhere else in the game, Mongoria will yell “Eek!” and throw herself off of the page. Because she’s a woman, get it!? … I didn’t really take to this game. Observations and Takeaways: Observation one is don’t write crappy dialogue, or if you do, at least don’t be sexist? But I didn’t need to play this to find that out. 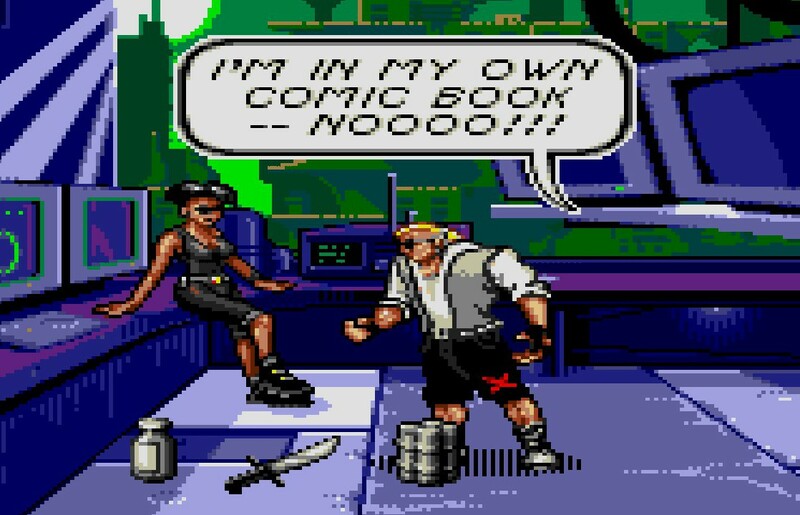 Comix Zone is a failure to me, as it fails to be fun. But that is educational, in its own way. It’s a great example of how crushingly difficulty should not be implemented, and how difficulty for its own sake can undermine what are otherwise good play systems. The combat is pretty impressive, and its a shame the game doesn’t let you enjoy it. The biggest takeaway though is the setting. 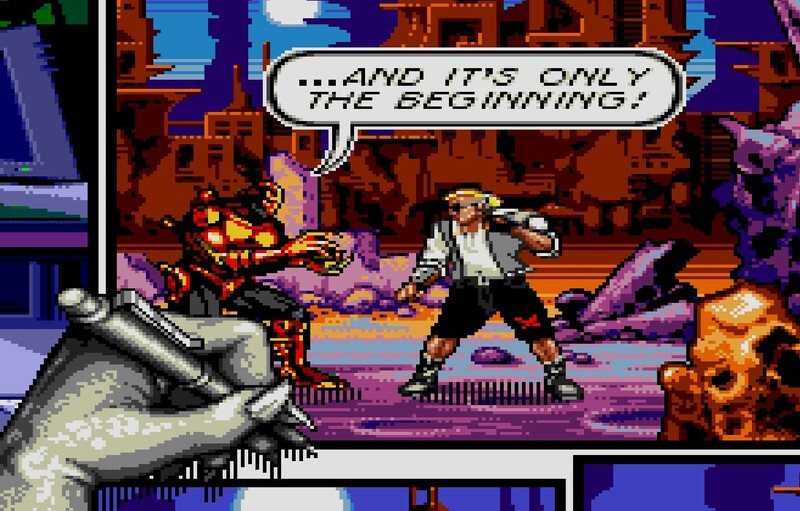 Comix Zone uses its comic book setting basically as a frame story and setting for its otherwise generic plot, but it’s actually a really cool conceit. I loved the way Sketch vaults outside the frames to move between rooms, and enemies being “drawn in” to fight you is a really compelling visual, and it’s a fantastic way to spawn enemies in-narrative. The comic book aesthetic is a great visual theme for a game, and it made me think of recent positive uses of it like the Telltale Walking Dead games. 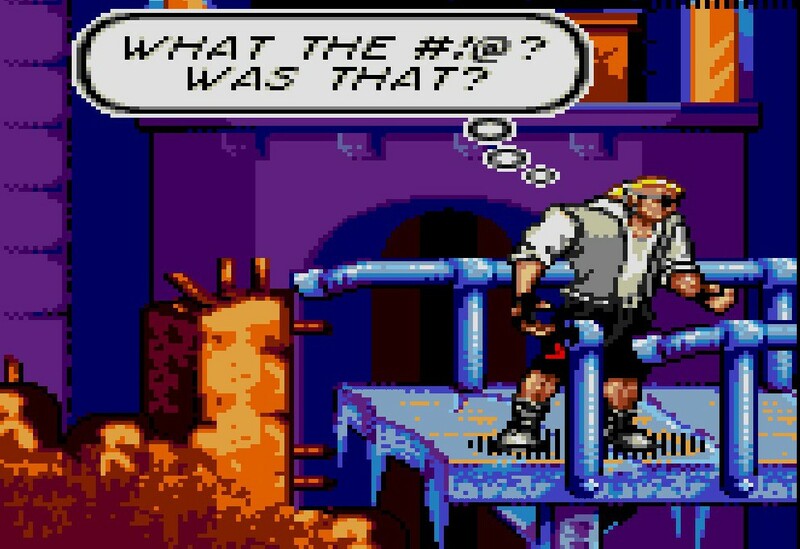 But while I’m sure there are other examples, I haven’t seen any other games that use the sort of meta-comic setting that Comix Zone uses. It’s not just the art theme, but woven into the play itself as gameplay elements. That’s actually a really interesting concept! Even bad games can have good ideas. Next Time: Next up will be Crack Down, an interesting combination of gun-n-gun gameplay with time-attack and maze elements, with a top-down perspective and ludicrous plot that involves time bombs.